Our big, white Samoyed, Kenai, is as gentle as a lamb. Children hang on her neck and pull on her tail, and she just smiles and playfully licks them. But, let an unwelcome animal in her fenced yard and she becomes a fierce protector. Possums, raccoons and rabbits have learned to stay away from her enclosed space. Nevertheless, one day last fall, a Magpie made the mistake of swooping to close to her head. With amazing quickness, the otherwise lumbering, gentle 85 pound ball of white fur jumped up and pulled the bird out of the air in mid-flight. I think the bird died of a heart attack before it hit the ground. 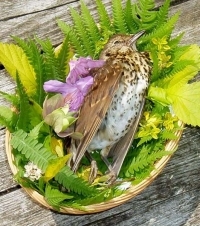 I immediately retrieved the bird and took it out the gate to the larger back yard and placed it on the ground in a spot I thought would be suitable for burial. Making my way back to the house to wash my hands and pick up a shovel, I observed Kenai lying on the ground, smiling and looking somewhat smug that she had once again protected her space. In the kitchen, while washing my hands, I looked out the window and witnessed what is probably the most amazing sight I have ever seen. Surrounding the deceased bird was a gathering of its peers. I counted over twenty friends and relatives of the Magpie species standing in a large circle. Some were still, some were bobbing their heads, some were marking time with their legs, but all were pointed toward their dearly departed. I witnessed this spectacle for more than five minutes and then, as if on cue, they all lifted off and flew toward the southwest. I was dumfounded! I had never seen more than three Magpies in our neighborhood at any one time. How did they know that their friend had died? Where had they come from? What was the meaning of their ritual? As I dug the hole to bury feathers, flesh and bones, I thought back to the hundreds of funerals I had conducted over the past fifty years. A few were for my children’s pet hamsters, goldfish (like a burial at sea in a porcelain ocean), and assorted dogs and cats, but never a bird. Most of the time as a clergy person and an Army Chaplain, I buried the human kind of animals. During those services people usually sat in rows, but in quite a number of them we stood in a circle and remembered, put flesh on the memory of the departed. Some of those services were in stately churches or modern funeral chapels, some were in lush green cemeteries, some on lonely and barren windswept hillsides, and a few were in the jungle. However, in all of them, some cried, some shook their heads, and some shuffled their feet nervously. Eventually, all of us left leaving the deceased alone.